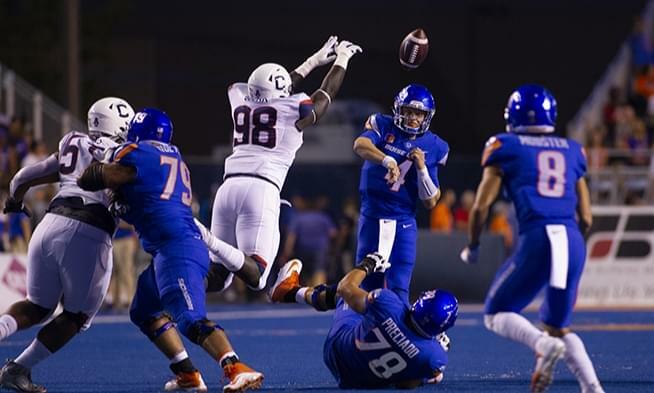 Boise State’s 19-13 loss to San Diego State on Saturday night was humbling … sobering … frustrating. 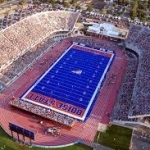 What if Boise State playing football at this level – good, but not great – is the new norm and we just don’t know it? The Broncos have started 3-2 in four of their past six seasons. Quarterback Brett Rypien has lost three games in each of his three previous seasons, and now has two this year, with at least seven games remaining on the schedule. Coach Bryan Harsin now has four unexplainable home losses on his resume – all as a double-digit favorite (New Mexico and Air Force in 2015, Virginia in 2017, SDSU in 2018). Boise State has never produced an undefeated Mountain West season under Harsin or Rypien. So, sitting here feeling duped after so much preseason hype, what were we expecting in 2018? The standard around here remains Chris Petersen and Kellen Moore, where those things didn’t happen under their powerful regime. We want Boise State to be great, because Petersen and Moore were great. When if fact, Boise State is only just good, because Harsin and Rypien are good. Great programs don’t have hiccups and scars and warts … and the Broncos have plenty of those since the two greatest icons in the history of the program departed. Boise State still wins plenty of games under Harsin and Rypien, and the team tends to finish strong, which gives us hope for the next two months, but let’s not pretend we haven’t felt the way we did Saturday night. 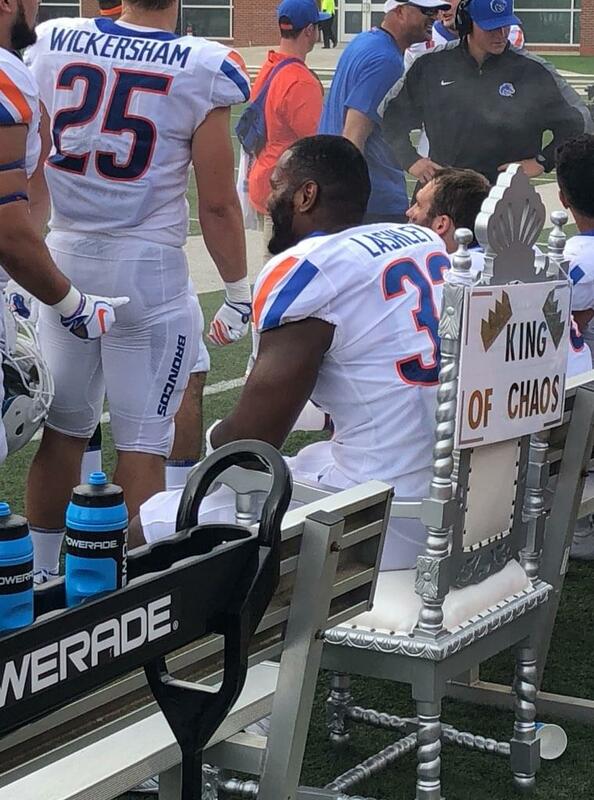 It’s the new norm for Boise State football, whether we admit it or not. Power 5 wins, New Year’s Six bowl appearances, dominant Mountain West seasons and guaranteed home wins have been replaced by wins over Troy, Las Vegas Bowl appearances, a couple of league losses a year … and curious and crushing upsets at home. Once-dependable results have been replaced with inconsistency … or in the case of Saturday night, poor quarterback play, a soft offensive line, questionable play-calling and curious special teams. What makes this so humbling … sobering … frustrating … is the fact that Harsin can coach and Rypien can play quarterback. In the two previous seasons where Boise State started the season 3-2 under Harsin (2014, 2017), the Broncos went 17-1 the rest of the way with two Mountain West titles and Fiesta/Las Vegas bowl victories. That gives Boise State hope for the rest of the season, though a NY6 bowl appearance and Rypien’s quest to finish his career in a big postseason game probably won’t happen after the ugliness we witnessed Saturday on the blue. A great season is gone. And a good season awaits. That’s the new norm for Boise State football. Boise State quarterback Brett Rypien was compared to NFL legend Tom Brady at least twice during Saturday night’s game broadcast at Wyoming, where the Broncos opened their Mountain West schedule with a dominant 34-14 victory. That’s ridiculous … because, right now, the Broncos’ senior is producing better results than Brady. The more realistic comparison? Rypien is playing football at a Kellen Moore level, which is standard operating procedure for most senior quarterbacks at Boise State (see chart below). Rypien’s last 18 Mountain West games: 15 wins, 33 touchdowns – and two interceptions. Saturday night at Wyoming: Rypien completed 28-of-42 passes for 342 yards, two TDs and no picks. Rypien’s stats this season: He’s completing 70 percent of his passes, and is averaging 347.3 yards a game with 12 TDs and no interceptions. He has thrown for 300-plus yards in five consecutive games, a school record. He has completed passes to 13 different players and has hit seven for TDs. “He’s as consistent week-to-week as I’ve been around and in the game it carries over. … He’s playing at a high level and he’s playing fast,” Boise State coach Bryan Harsin said. Let’s add one more: Humble. “I’m just practicing well, my film studies have been well and our receivers are making plays. … And our offensive line is doing a great job of protecting. I don’t think that’s been talked about enough,” Rypien said after the Wyoming win. Playing football at a high level is the norm for Boise State senior quarterbacks. Of the past seven, dating back to 2000, five have finished their careers with strong seasons. Grant Hedrick, Moore, Jared Zabransky, Ryan Dinwiddie and Bart Hendricks were dominant. Moore is the standard-bearer – and Rypien has a strong chance to match the success of No. 11’s senior season. Maybe even surpass it, if Rypien can win a league title, which Moore did not in his final season. Rypien can’t win a MW title by himself, and the Broncos continue to struggle in the run game, producing only 161 yards on 46 carries (3.5 yards per carry) against Wyoming. The lack of production has turned into a trend, and a potential concern for the future. But the way Rypien is throwing the ball right now, it doesn’t seem to matter. NEXT GAME: San Diego State (3-1, 0-0 MW) at Boise State (3-1, 1-0), 1:30 p.m., Saturday, Albertsons Stadium, 93.1 FM and 670 AM, ESPNU. The Aztecs had a bye this week. BOISE STATE & THE NFL: TWENTY FORMER BRONCOS IN THE LEAGUE – WHO’S STARTING AND WHO’S FIGHTING FOR JOBS? Jay Ajayi, Eagles, RB, No. 26 … This could be a workhorse season for Ajayi, who has become a leader in the running back room. He’s working with a personal chef, is in the best shape of his life, and is going into a contract year. Tyrone Crawford, Cowboys, DE, No. 98 … Crawford has dropped some weight in the offseason to increase his speed and improve sack production (an issue with Dallas fans). George Iloka, Bengals, FS, No. 43 … The good news: Iloka has emerged as a team leader. The more pressing news: Iloka is the leader of a group that must create more interceptions (Bengals’ safeties had only three picks last season, including one by Iloka, who has nine in 83 career games). 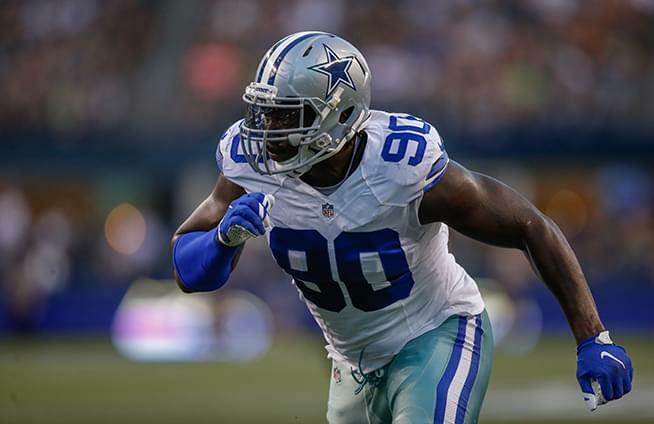 Demarcus Lawrence, Cowboys, DE, No. 90 … The second-most productive sackmaster in 2017 is listed as the No. 34 best player in the league by the NFL Network. The franchise tag player with a one-year contract has been working with legendary former Cowboy Demarcus Ware – meaning production could rise in 2018. Charles Leno, Bears, LT, No. 72 … Has played every snap for two years, quietly goes about his business and provides great value to an offense that is creating some buzz this offseason. Matt Paradis (Council HS), Broncos, C, No. 61 … He has started every game since 2015, allowed no sacks in 2017 and is finally healthy after two hip surgeries. Paradis also becomes a free agent in 2019, so this is a contract year. Orlando Scandrick, Redskins, CB, No. 26 … The former Cowboys star who was shipped out of Dallas after so many injury issues is battling Quinton Dunbar/Fabian Moreau for the right to start opposite Josh Norman. Jamar Taylor, Cardinals, CB, No. 28 … The offseason acquisition is the leading candidate to start opposite Patrick Peterson, but there’s also competition from Brandon Williams. Darian Thompson, Giants, FS, No. 27 … The Giants have a lot of questions at the safety/defensive back positions, despite a lot of depth. Thompson has been inconsistent in the league, and is penciled in to start, but is also sharing practice rotations with at least three other players. Leighton Vander Esch (Salmon River HS), Cowboys, LB, No. 55 … The depth chart is a work in progress, but the trio of LVE, Sean Lee and Jaylon Smith give the Cowboys their strongest linebacker combo in years. Kamalei Correa, Ravens, LB, No. 51 … He’s versatile enough to play inside and outside, which helps him remain on the roster, but Correa remains mostly a depth and special teams contributor. Doug Martin, Raiders, RB, No. 28 … Martin was added to the Raiders’ roster to play behind Marshawn Lynch. He’s impressed teammates in the offseason with his fresh attitude and quick legs … and could turn into a starter if Beastmode goes down. Rees Odhiambo, Seahawks, OL, No. 70 …The offense has revamped a struggling line with new coaches and a new system. The former left tackle can play anywhere on the line, and could end up as a backup to new right guard D.J. Fluker. Tanner Vallejo, Bills, LB, No. 40 … Heads into training camp as a backup in the middle, behind new first-round draft pick Tremaine Edmunds. Could be the final linebacker to make the roster, and is expected to play a heavy rotation on special teams. Cedrick Wilson, Cowboys, WR, No. 16 … The sixth-round draft pick has created a quick name for himself – picking up the playbook and making plays in OTAs. The wide receiver battle in Dallas is intense, and Wilson looks to be one of eight players fighting for three roster spots. Donte Deayon, Giants, CB, No. 38 … One of the smallest players in the league should make the roster – he’s a hard-worker and popular in the locker room – but the Giants’ have a ton of depth in the defensive backfield and Deayon has played in only four games in two seasons. Marcus Henry, Seahawks, C, No. 62 … He landed a roster spot after a free agent tryout – not an easy thing to do. He’s one of three centers on the roster, and is playing with house money at this point. Chanceller James, 49ers, S, No. 43 … Coming off an ACL injury and facing a deep roster – not a good combination. Jeremy McNichols, 49ers, RB, No. 33 … Buried deep on the depth chart – has an upside and can play on special teams. Practice squad candidate. Jonathan Moxey, Cardinals, CB, No. 25 … The defensive backfield in Arizona is loaded – a practice squad player at best. Boise State is bringing its sports stars back to campus April 13 for the first Hall of Fame induction ceremony in 10 years. Two football players are being honored: Legendary quarterback Kellen Moore and offensive lineman Nate Potter. They will be the first football players inducted into the BSU Hall of Fame since quarterback Bart Hendricks made the Class of 2007. Quarterback: Ryan Dinwiddie (2001-03) … The toughest, most efficient and productive quarterback in Boise State history – until Moore came along to set a new standard. Still holds two NCAA records (most yards gained per attempt/career and most yards gained per completion/career). Dinwiddie is one of only six quarterbacks in college football history with a career passing efficiency rating of 168.0 or higher (others are Moore, Sam Bradford, Marcus Mariota, Tim Tebow and Baker Mayfield). Running back: Brock Forsey (1999-02), Ian Johnson (2005-08) … Unfortunately, this leaves out NFL talent Jay Ajayi, Doug Martin and Jeremy McNichols, but Forsey and Johnson were more than great football players, one known for touchdowns and toughness, the other for flair and dramatics. Forsey and Johnson were 4,000-yard rushers (Cedric Minter is the only other Bronco in that group), made huge impacts on their teams, and resonated in the community beyond your typical football player because of their own unique styles. Wide receiver: Matt Miller (2011-14), Thomas Sperbeck (2013-16) … These two separate themselves – slightly – from a ridiculously talented group of Hall of Fame-type receivers for doing it the Bronco Way … tough, blue collar, quiet/humble, overachievers. Their intangibles, along with world-class production, separate Sperbeck and Miller from the consistent Austin Pettis and the explosive Titus Young. Tight end: Derek Schouman (2003-06) … The four-year starter and local fan favorite – “Shoooeeee’’ – caught two of the most important passes in Boise State’s postseason history – the game-winner in the 2003 Fort Worth Bowl and the overtime touchdown in the 2007 Fiesta Bowl. 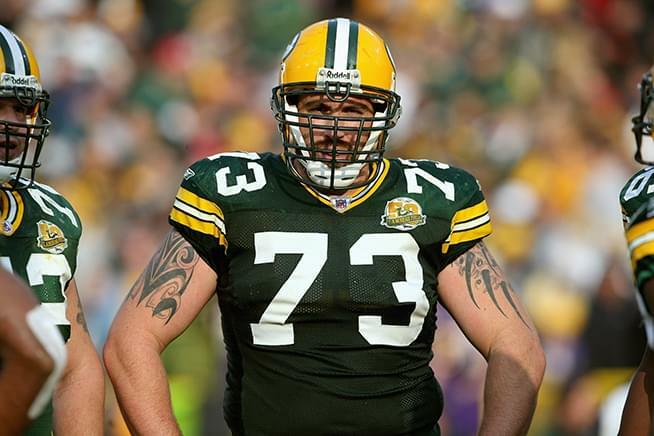 Line: Scott Huff (1999-02), Daryn Colledge (2002-05), Ryan Clady (2005-07), Charles Leno (2010-13), Matt Paradis (2010-13) … Colledge and Clady are the two most dominant linemen in Boise State history, Huff is the best center in school history after starting 40 games, and Leno (39) and Paradis (26) each finished their productive careers with impressive consecutive start streaks. Line: Ryan Winterswyk (2007-10), Shea McClellin (2008-11), Demarcus Lawrence (2012-13) … Three dominating linemen who spent most of their time in the opponents’ backfield. The trio combined for 62 sacks and 134 tackles-for-loss. Winterswyk and McClellin were four-year mainstays (42 sacks between them), while Lawrence did all of his damage in two powerful seasons (20 sacks in 23 games). Linebacker: Andy Avalos (2001-04), Korey Hall (2003-06), Tanner Vallejo (2013-16) … Hall and Avalos are two of the most decorated and celebrated linebackers in BSU history; both were physical, tough, durable, hard-working and smart playmakers who rank in the top five in all-time tackles. Vallejo (more overall production, played a fourth year) edges out Kamalei Correa (best sacking LB in BSU history?) and Bryan Johnson (two-way all-around star) in a tight contest for the third spot. Cornerback: Kyle Wilson (2006-09), Jamar Taylor (2008-12) … Narrowing down defensive backs was the toughest part of this project. After all, Boise State has earned the nickname DBU because it continuously puts top defensive back talent in the NFL. Wilson separates himself because he was a two-time All-American (2008-09) and was Boise State’s first defensive first-rounder into the NFL. Taylor edges out Orlando Scandrick after a playmaking career that covered five seasons. Cornerback/safety: George Iloka (2008-11), Darian Thompson (2012-15) … Iloka was a freshman All-American, a three-year starter and an all-league player in the WAC (2010) and Mountain West (2011). Thompson, a rare two-time All-American (2014-15), is third in Boise State history with 19 interceptions. Safety: Quintin Mikell (1999-02) … The 2002 All-American changed the position at defensive back, bringing a methodical, physical and attacking style to the Broncos’ roster. He is one of only two Boise State players to record 400-plus career tackles (the other is linebacker Scott Russell). For whatever reason, Boise is blessed when it comes to the NCAA Tournament. Since 1983, and eight times since, superstars and super highlights have dominated Taco Bell Arena in March. The college basketball tournament returned to the Boise State campus Thursday after a nine-year absence, and once again we were blessed with drama: Three games decided by an average of 5.7 points and the biggest upset of the day (No. 13 Buffalo over No. 4 Arizona). Outside of the three close games in Boise, the other 13 first-round games were decided by an average of 13.3 points. Let’s do it all over again Saturday when No. 4 Gonzaga, No. 5 Kentucky, No. 5 Ohio State and No. 13 Buffalo return to Taco Bell Arena for second-round games (schedule listed below). The Zags don’t have to play their best to win early round tournament games – this, obviously, is a tested program that knows how to take care of its business. Gonzaga really struggled to shoot the ball against UNC Greensboro’s pesky defense, and the Zags’ defense gave up a sloppy 41 second-half points, but players never panicked and were clutch down the end. Gonzaga-UNCG was the first game of the day, and maybe fans were still a little sleepy, but the crowd support wasn’t as intense as expected. That will happen Saturday against Ohio State. The Wildcats were sleepy good – and still looked fragile enough to lose to Buffalo, which would thrill fans in Taco Bell Arena. Kentucky played questionable defense in its five-point win over Davidson, and didn’t make a 3-pointer in a game for the first time since 1988. Still, future NBA players Kevin Knox and Shai Gilgeous-Alexander were dominate with a combined 44 points, 14 rebounds, 8 assists and 5 steals. Knox played especially well down the stretch, which shows he’s capable of taking over a game anytime he wants. Buckeye Nation, making its Boise debut, produced a strange stat line in the win over South Dakota State: 40 attempts from 3-point range (made only 12), 47 rebounds and only six players scored. This looks like a team that could lose by double-digits Saturday against Gonzaga – or go on a deep NCAA run. Ohio State is basically a three-man team – and CJ Jackson, Kam Williams and Keita Bates-Diop each went for 20-plus points Thursday. Bates-Diop looks like a future NBA player after going for 24 points and 12 rebounds. The MAC champions play with confidence for a reason – they’ve won 27 games and absolutely controlled Arizona from start to finish. The Bulls looked like a better, more skilled, more determined team than Arizona – and the Taco Bell Arena crowd will feed off that quality in Saturday’s game against Kentucky. Guards CJ Massinburg and Wes Clark are shooting/active dynamos who also play with a ton of defensive energy, but the rock star is Jeremy Harris. He has dreadlocks, a beard and tattoos, and wears a headband. One word to describe his game: Smooth. The Big Three combined for 67 points on 58 percent shooting against Arizona. Kevin Knox, Kentucky, F, No. 5 … Co-SEC Freshman of the Year projected to go in the first round of this summer’s NBA Draft. Shai Gilgeous-Alexander, Kentucky, G, No. 22 … Considered a first-round NBA Draft pick this summer because of his length, defense, versatility – and growing potential. Jeremy Harris, Buffalo, G, No. 2 … Deceptively skilled and active all over the court, making him almost impossible to guard. CJ Massinburg, Buffalo, G, No. 5 … Team’s leading scorer is a tough leader who is deadly from 3-point range. Wes Clark, Buffalo, G, No. 10 … Missouri transfer is listed at 6-feet, plays more like 7-feet. Ask Deandre Ayton. CJ Jackson, Ohio State, G, No. 3 … The junior played the best game of his career Thursday night. Kam Williams, Ohio State, G, No. 15 … Tough, appears to be juggling a lower-body injury, and remains highly productive; had a huge four-point play late in Thursday’s win. Keita Bates-Diop, Ohio State, F, No. 33 … The Big Ten Player of the Year excels on both ends of the court and is headed to the NBA after this season. Johnathan Williams, Gonzaga, F, No. 3 … Strong two-way player who can dominate on both ends of the court; was especially impressive on defense against UNCG. One of three players Thursday to finish with a double-double (19-13). Josh Perkins, Gonzaga, G, No. 13 … The point guard hit several big shots Thursday and finished with 16 points. Perkins is an elite ball distributor who had only 2 assists (he had 22 in three West Coast Conference Tournament games) but was asked to do more Thursday. Watch for the way he handles the ball Saturday. Zach Norvell Jr., Gonzaga, G, No. 23 … The freshman has a knack for making clutch shots, and hit a huge 3-pointer to give the Zags a 67-64 lead with 20.8 seconds remaining against UNCG, then added a free throw at 7.8 seconds. He finished with 15 points. Rui Hachimura, Gonzaga, F, No. 21 … The Japan native had a quiet game Thursday, with 4 points and 5 rebounds. He averages 11 points a game and should play a more significant role Saturday, though that could be difficult against Ohio State’s dominant inside players. PEYTON ALDRIDGE, DAVIDSON, F, NO. 23: He’s not the next Steph Curry, the program’s most famous alum, but the 6-8 senior is still a monster presence on the court. The Atlantic 10 Co-Player of the Year and former high school quarterback is averaging 21.5 points and 7.8 rebounds a game. He has started every game of his career. DEANDRE AYTON, ARIZONA, F/C, NO. 13: The 7-1, 250-pounder has freakish size and ability – and could be the No. 1 pick in this summer’s NBA Draft. The freshman one-and-done is averaging 20.3 points and 11.5 rebounds a game, and was just named the Pac-12 Tournament Most Outstanding Player. KEITA BATES-DIOP, OHIO STATE, F, NO. 33: The 6-7 Big Ten Player of the Year and second-team All-American is essentially a more polished version of Boise State standout Chandler Hutchison, also a NBA prospect with a true position and body type the NBA covets. Bates-Diop is averaging 19.4 points and 8.8 rebounds a game. MIKE DAUM, SOUTH DAKOTA STATE, F, NO. 24: “The Dauminator” is the Summit League Player of the Year, is one of the best shooters/scorers in all of college basketball, and an NBA prospect. The junior is averaging 23.8 a game this season and has scored 2,205 career points. Named the nation’s fourth best power forward by Gary Parrish of CBS Sports. SHAI GILGEOUS-ALEXANDER, KENTUCKY, PG, NO. 22: The lanky freshman was voted the SEC Tournament MVP and leads the Wildcats in assists (171) and steals (54). Has scored in double figures in 18 of his last 23 games. An emerging NBA prospect. RUI HACHIMURA, GONZAGA, F, NO. 21: A rock star in his native Japan, the 6-8 sophomore has played well at Gonzaga and has emerged as an NBA prospect. The All-West Coast first-team player this season makes 57.4 percent of his shots and is averaging 11.3 points a game. KEVIN KNOX, KENTUCKY, F, NO. 5: The 6-9 Knox is another potential NBA lottery pick in the Boise field. He is the SEC Co-Freshman of the Year and is averaging a team-high 15.6 points and 5.4 rebounds a game. BOB McKILLOP, DAVIDSON, COACH: The Boise bracket is loaded with big coaching names – Mark Few (Gonzaga), Sean Miller (Arizona) and John Calipari (Kentucky) – but McKillop has his own intriguing story. He’s in his 29th season with the North Carolina program, has won 554 games, and once was smart enough to give Steph Curry a college scholarship when a lot of other college coaches didn’t. JOSH PERKINS. GONZAGA, G, NO. 13: Perkins drives the engine for the Zags, shooting a team-high 3-pointers (80-of-196, 40.8 percent) and leading the team with 182 assists. JOHNATHAN WILLIAMS, GONZAGA, F, NO. 3: The leading scorer on a balanced roster, averaging 13.5 points a game on the strength of 56.6 shooting. He also averages a team-high 8.3 rebounds a game. LAS VEGAS – Boise State basketball coach Leon Rice had one of the best teams in the Mountain West during the regular season. It’s scary how one bad night in Vegas changes your perspective. Rice thinks his program is growing, and it is, though November through February presents a very different picture than March. Rice takes pride in the direction of his program, as he should, but the only direction the Broncos are headed now is home after a frustrating 78-75 loss to Utah State in the Mountain West Tournament quarterfinals Thursday night in Las Vegas. It’s easy to get sucked into the emotions of one tough loss, as fans did and always do on social media, but the outcome was another painful reminder that this program has been stuck under a ceiling for 30 years. Right now, Rice’s primary issue is the lack of winning in March. Boise State had one of its best teams in school history, one of its best players in future NBA Draft pick Chandler Hutchison, and both team and fan base invested time, energy and passion into something good. Now think about something bad: Taco Bell Arena is hosting the NCAA Tournament and eight of college basketball’s finest teams next week … and the Broncos and their 23 wins will be who knows where playing in the Not Invited Tournament. 63.5: His overall winning percentage in eight seasons, the best in school history. 50.0: His winning percentage in March (17-17). 36.8: His winning percentage in postseason games (7-12). Boise State has won three regular season championships since leaving the Big Sky in 1994. Boise State has won one conference tournament title since leaving the Big Sky. Boise State has played in seven Mountain West Tournaments, has been bounced after one game five times, and has never reached the championship game. Boise State is 0-7 all-time in NCAA Tournament games, including 0-2 under Rice. Sorry, that’s a ceiling, or as an emotional Rice was asked after the Utah State loss, that’s “slow growth.” He didn’t like the question, and responded with a long rambling answer that put the focus back on his regular season success. “We went from the WAC to contending. We won the Mountain West. We contended for a title four years. And so I don’t get what – I think it’s ignorant to say ‘slow growth.’ You’re talking about a UNLV program that has won a national championship, a national championship. You’re talking about a San Diego State team that’s 18 straight years of being terrific, talented, toughest places to play in this league. “Slow growth is – we’re selling out Taco Bell Arena. We’re 15-1 at home and on and on and on. We’re putting a guy in the draft this year. “So ‘slow growth’ may be the most ridiculous term I ever heard from anybody about the basketball program and where we are. And you don’t measure a program by a three-day tournament. You measure it by how it does in the league every year, because that’s over the course of three months. And that’s night in, night out, for three months. Rice also had an odd answer concerning the Broncos’ lack of success in the Mountain West Tournament. Final thought: It was a surprise to see so few Boise State fans at the tournament, especially compared to football’s traveling fans. If one thing is certain after Thursday’s loss, it’s this … Fans enjoyed this year’s basketball team, as they should have, but they still don’t trust the program.